The new SAP (s SAP) Social Media Analytics service aims to bring more consumer-centric smarts to SAP customers by pairing NetBase semantic search and analytics with SAP’s own business intelligence expertise. The cloud-based service will let “business users look at Facebook, Twitter, [and] news feeds to get insight on market trends, what people are talking about, perceptions and a deeper level of information [about] their purchasing intents or what’s driving their conversations,” said Byron Banks, SAP’s VP of business analytics solution marketing. 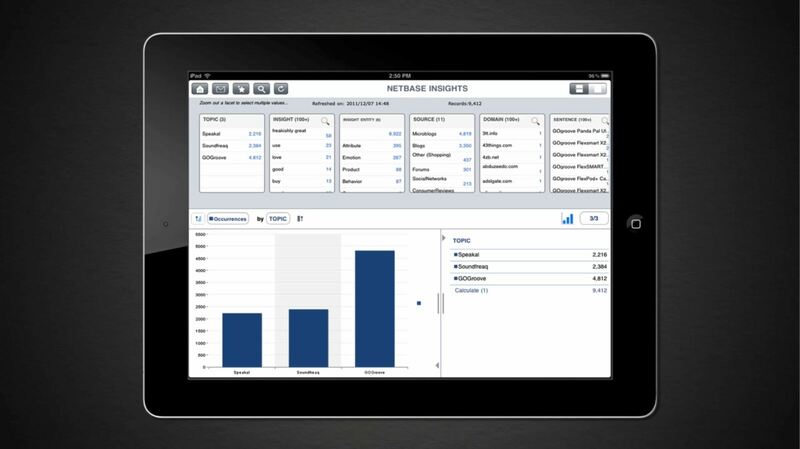 A graphical dashboard will bring query results from both NetBase and SAP analytics to an iPad (s aapl) or other screen of choice, the two companies said. This joint effort is just the latest example of a traditional tech vendor trying to get a handle on the unstructured data explosion on social media sites. Business customers want help parsing that data to fine-tune marketing campaigns or to gauge customer sentiment to guide product development and design decisions. SAP has a big stake in traditional business intelligence/analytics by virtue of its BusinessObjects unit. But now the company — like its competitors — is trying to get a grip on data that lies beyond the rows and columns of relational databases. That unstructured data — reams of which is generated every minute by people on Twitter, Facebook, and blogs — is a potential treasure trove of companies that make consumer packaged goods or other products. The need to better mine that data helped drive Hewlett-Packard’s (s HPQ) $10.2 billion buyout of Autonomy; Oracle’ s (s ORCL) acquisition of Endeca and Salesforce.com’s (s CRM) purchase of Radian6 — over the last eight months. SAP execs have made very public noises of late to make the ERP giant more consumer focused. This is one step in that direction. SAP will start selling the SAP Social Media Analytics service with the user-friendly dashboard in January, but will add more NetBase-to-SAP integration over time, Banks said. “On the backend is NetBase’s cloud ConsumerBase which is 30TB of pre-analyzed, normalized data from captured news feeds, Twitter and Facebook. We capture 95 million posts per day and put that into a database that gives every customer a year of data. ConsumerBase runs on NetBase servers but SAP will provision them,” said NetBase Chief Marketing Officer Lisa Joy Rosner. NetBase does more than text searches. The company’s computational linguists use natural language processing (NLP) to delve into the intended meaning of words used on social sites. It can, for example, make an educated guess about when the word “s**t” is an expletive or a compliment; it can be both. “We’re designed to provide deep insight into what people are talking about. Radian6 can measure buzz — how much people talk about Listerine. (s jnj) We tell you that when they talk about Listerine, they’re doing so because it kills dandruff or kills germs, or some other thing,” said Rosner. Then they wanted to figure out what was behind the discrepancy, so they went back to their operational data to find that pineapple was in limited production and sold through small channels. “That meant you could get it at Trader Joe’s one week, and the next you couldn’t find it,” Rosner said. The combination of NetBase’s social analysis and SAP’s ERP and other backend systems could help companies in similar situations change course quickly based on in-coming social media information. There are a few gaps in this partnership. While SAP’s ERP and analytics products are big worldwide, NetBase is working to add new language support to its service, with German and Spanish versions in beta now and with Japanese slated to come online this year. NetBase now covers just alphanumeric characters, although it is working to identify emoticons so that they can be incorporated into its analysis.